One in three Australian men and one in four women are directly affected by cancer before the age of 75 and over 100,000 new cases are diagnosed every year. 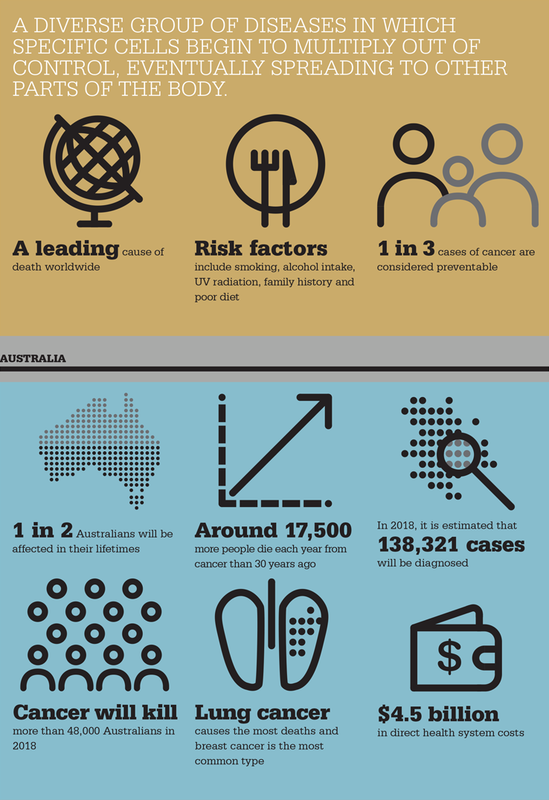 While survival rates have increased significantly over the past 20 years, cancer remains a leading cause of death: while more than half of the diagnosed cases are successfully treated, every year over 36,000 Australians die of the disease. Cancer costs the health system over $2.7 billion per year, and its cost in terms of pain and suffering is inestimable. The only way to change these statistics is with high-quality prevention, early detection and new treatments: our best chance of achieving these goals is with basic medical research. Cancer is a complex and varied disease, which is why, at SVI, we approach it from different angles. The Stem Cell Regulation Unit investigates stem cells and their role in cancers of the blood. In the Molecular Genetics Unit, Jörg Heierhorst’s group is working on understanding how the DNA damage that underlies most cancers develops while Andrew Deans in the Genome Stability Unit works to understand the mechanisms cells use to protect themselves from cancer-causing mutations. Dr Andrew Deans, SVI - What is the cause of Fanconi Anaemia?